I didn't see this forum before. I found the default standard skins of Classic shell look not very well in windows 8. I prefer for example Start8 app skin, but I don't want to pay, and I'm used to use classic shell. 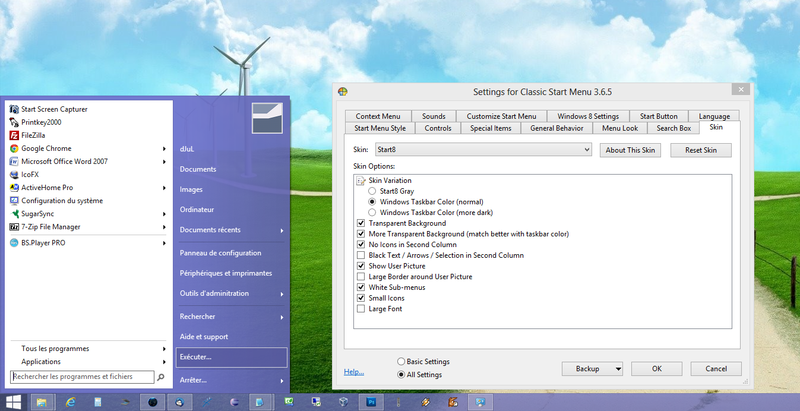 Then I made a skin like Start8 with a glass effect for Classic Menu. 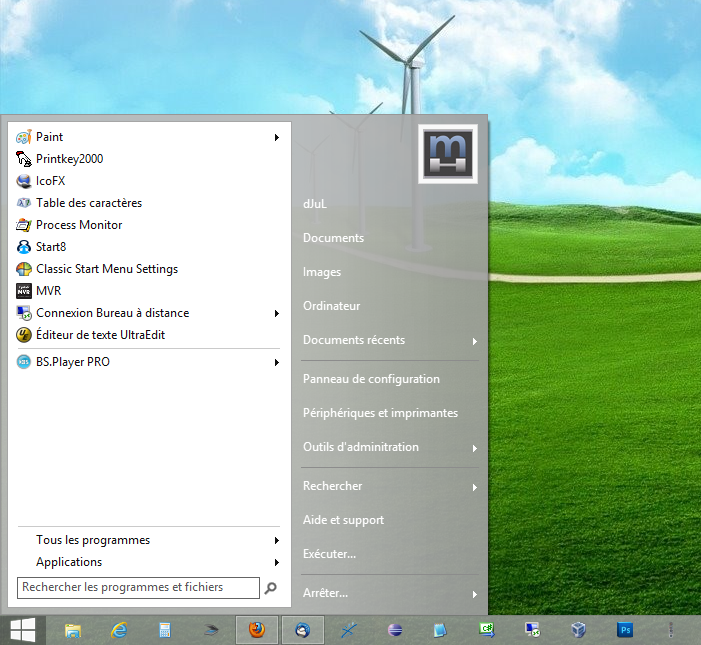 There is 2 buttons img in the pack, one for standard taskbar, and one for little taskbar. File comment: Please download last version ! Last edited by dJuL on Mon Feb 18, 2013 4:50 pm, edited 9 times in total. I'd like to do it as well! Maybe we can add shadow manually to tha submenu background. I'll try this on my skin. I already tried too to add shadow manually, but it's not possible to do something correct in fullglass mode. It is only OK in fullAlpha mode (but it's not transparent with the desktop). Where are these images stored? like this shadow? And the quicksearch border for example? Nice skin. Could you also make non transparent version? * Large or Small border around the user picture. A "White sub-menus" option needs to be there. Cool. 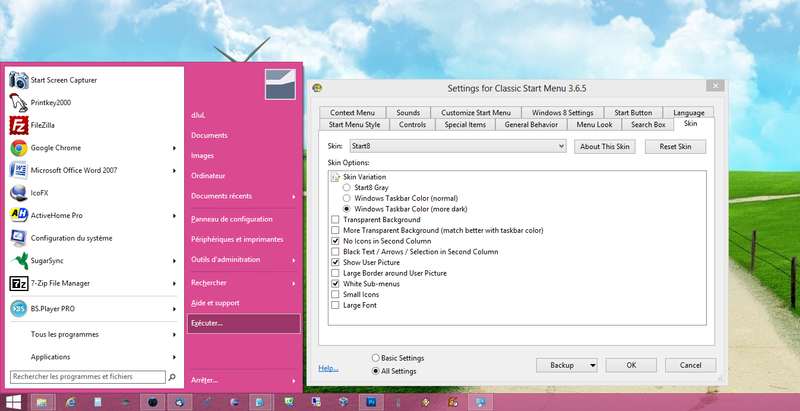 Now we just need the Start menu color to more closely match the Taskbar color. Mine does that. By the way, why dont you like my skin? Should I also make a white submenu option? I like your skin. 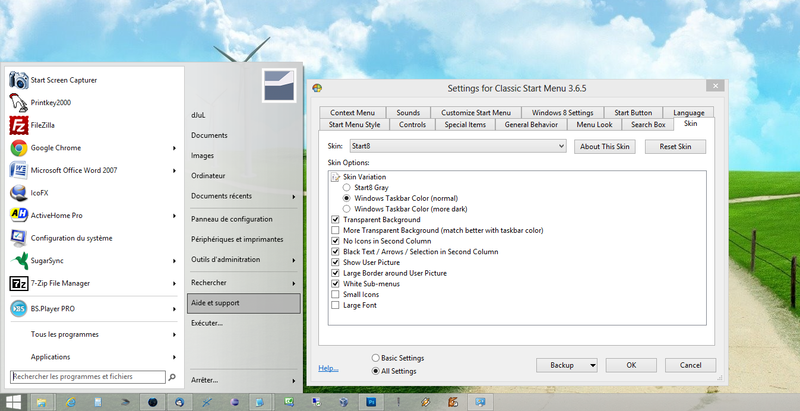 I meant in general Classic Shell code needs to be tuned more so at hue, saturation, brightness, and color intensity, the taskbar color will be matched on Windows 8. 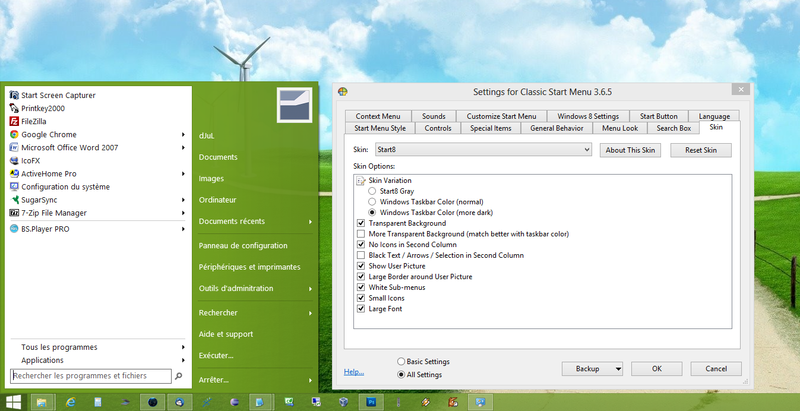 You can define custom colors for taskbar and titlebars in the windows control panel. How can I do to match exactly with your color ? Yes it could be a solution if we stay with one unique color for the skin. Nope I meant if Ivo will update CS's glass to more closely match taskbar color. I didn't mean you have to modify the skin. Compared to Start8, the color doesn't match if the color intensity is reduced. 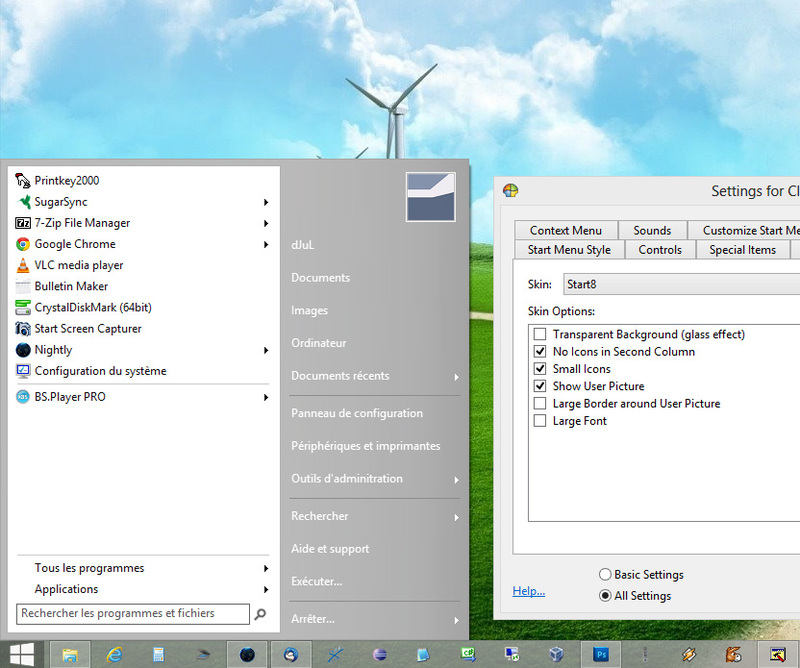 maybe a checkbox for "enable aero blur, on w8 (maybe for xp to idk)' if that project ever matures/ and ivo decides to add it..
Hi dJuL, this is a really cool skin! Thank you very much. 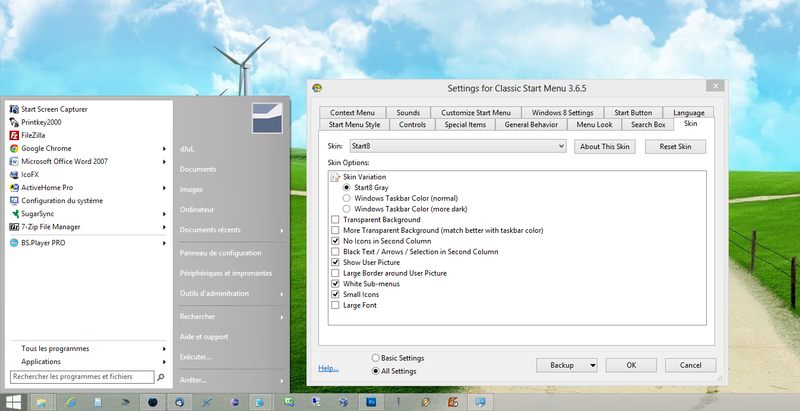 Could you please include support for the "glass colors" so the start menu color matches the theme's color and can be customized by changing the Windows theme colors? e.g. like the built-in "Windows Aero" skin. Ok, I will look what I can do. I didn't do it because it doesn't match properly with the windows color. - 2 variations : Start8 Grey, and Now possibility to use windows color. When I will have a little time I will work on borders, separators, and selection on 2nd column, for a better integration when choosing windows color variation. 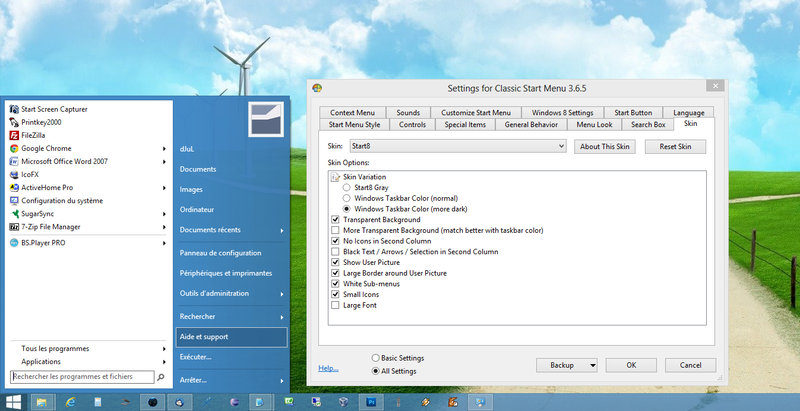 - Borders, separators and selection are now in the same color theme as windows color. Many thanx. Me likey. I find the options "Windows Taskbar Color (normal), "Transparent Background" and "More Transparent Background" checked give me the results I want. 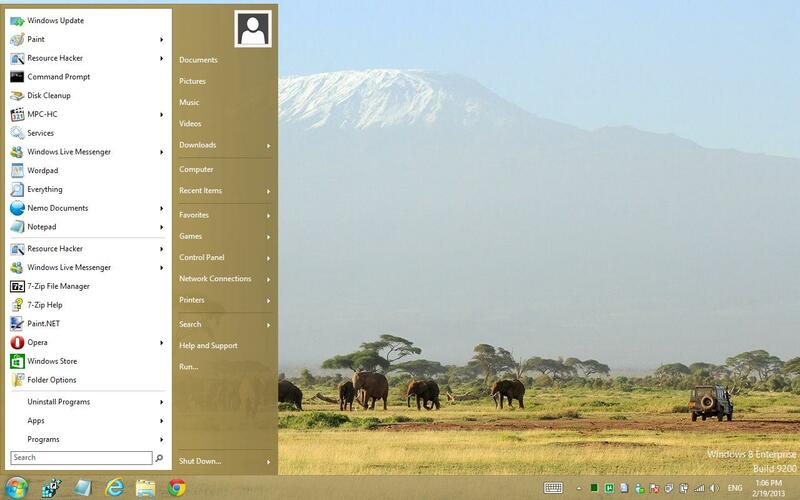 I also turned off the option "Enable Menu Shadow" on the "Menu Look" tab so more closely match Windows 8's style. There is already a skin named Windows 8. - Adjusted the bitmaps so when color intensity is reduced and transparency options are checked, the Start menu color matches the taskbar color. but I think it needs modifications. At first it is a little bit too dark I think. And the selection in the right column is not ok, color is the same as the background. If you want to make the background more dark, you need to change the selections bipmaps too. With little icons options selected, there is also a problem with the text padding. You're right. The shade is darker. I must tweak it. Nice suggestion about the user picture too. I did change the padding as well for small icons and all the changes you observed with a sharp eye . I made the changes with also another intent: I am trying to make the same skin look/work well on Windows 7 (with glass rendering), so that only a few options need to be changed but the same skin can be used. Okay, we will do this. I will fork my skin in a separate thread. You are free to make modifications to this one or continue with the last version of your own skin, discarding the modifications. No problem. Thanks for your skin though. It was useful for me in creating my skin. but why i can not have this skin like you? It's too bad when older skins don't work properly anymore with newer versions of Classic Shell. 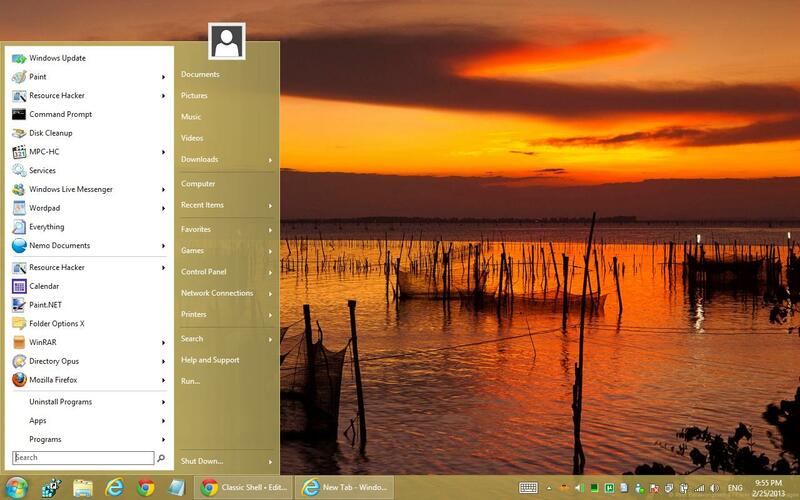 Windows 8 skin is probably best similar skin to use in updated CSM. With that one, you get that neat extra text shadow feature on second column. Could uninstall new version, download, and install an older version from years back? V3.6.8 was popular back then. Then the old skin should work. probably some text requires changing in the file, to work in new CSM version. Could be as simple as one letter, or number change, or big overhaul. Anywhere from five minutes, to hours long fix. Who knows? Difficult to tell when the unexpected default white menu shows. No clues. or original maker could, unlikely though, probably moved on. where can i get the old version? and the search bitmap was out of registration on HDPI. dJuL made it to work in Windows 8. 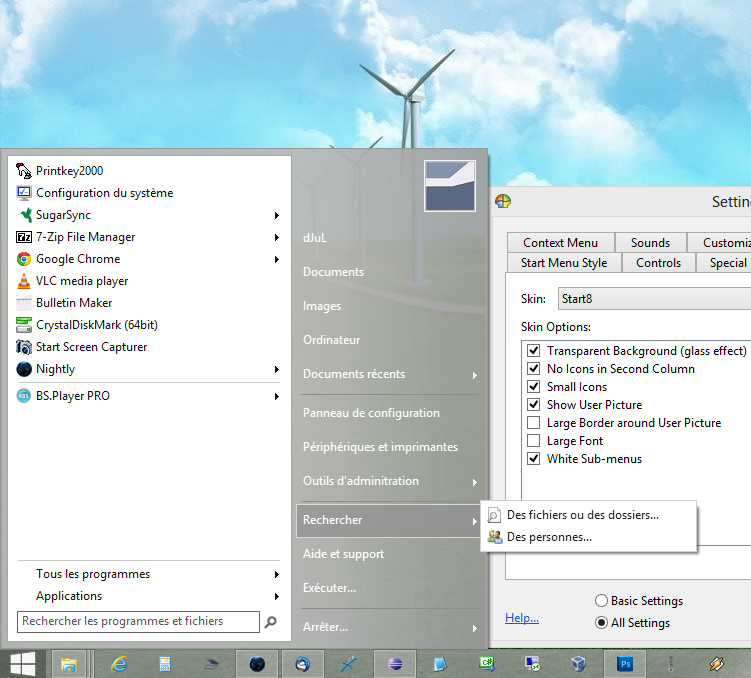 If using in Windows 10, the grey menu might be too bright, or have residual glass blur color on it. 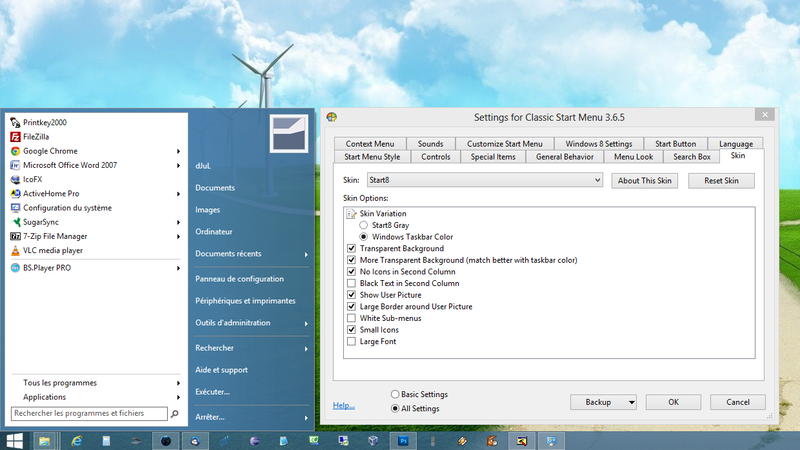 To fix, uncheck the "Enable menu glass" in the "menu Look" tab of CSM settings. 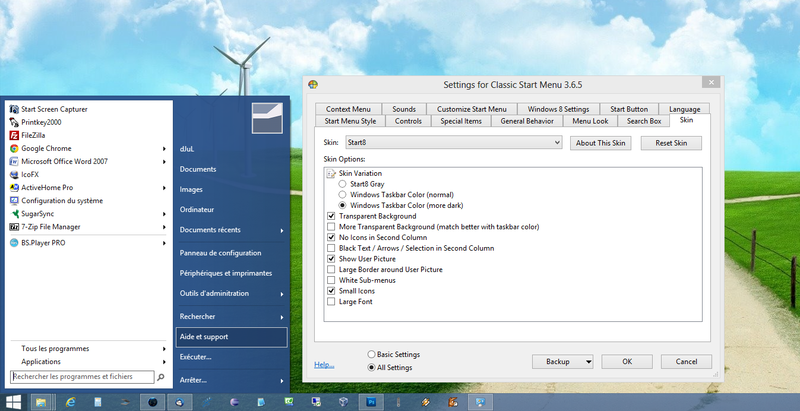 Glass system color on Win 10 will be stronger on menu. Let me know if something was missed.